This position paper was written by Mr. Uri Ben Yaakov, Senior Researcher, Dr. Dror Harel, Research Fellow, and Ms. Nadine Liv, Researcher, with the assistance of the ICT team and their colleagues. The new Israeli counter-terrorism bill, that was put forth by the Government,constitutes an attempt to regulate internal Israeli legislation and adjust the tools at the authorities’ disposal to cope with renewed terrorism threats, while striking an appropriate balance between the state’s security interests and its need to safeguard the fundamental principles of the liberal-democratic system and the human rights that it protects. Before beginning an in-depth analysis of the bill at hand, we wish to emphasize the importance of the proposed bill in providing an answer to the operative needs of Israeli security agencies in coping with the phenomenon of terrorism, while, at the same time, not overlooking relevant concerns regarding human rights. It is apparent that a great deal of thought went into the wording of the bill and that all parties involved were aware of the importance of the task before them. In this regard, it should be noted that Israel is not the only country having to constantly balance these two contrasting aspects. National laws of other countries grappling with terrorism face those same uncertainties. 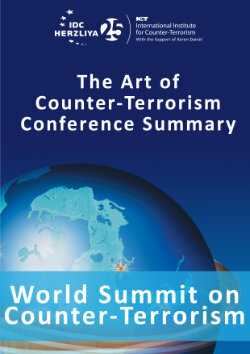 Various countries have selected different solutions to the inherent conflict between counter-terrorism needs (not to mention a country’s obligation to ensure the security of its citizens), social values, questions of justice and morality, and the interpretation of international humanitarian law. It is also uncertain whether international rules of war can be applied to the asymmetrical confrontation with terrorism. Among the methods used by various countries to combat terrorism and simultaneously preserve human rights are criminal penalties as well as administrative and civil sanctions intended to deter terrorist organizations and their members from carrying out terrorist attacks from the outset. Effective deterrence is an issue composed of various elements (that sometimes even contradict one another), which makes it even more complicated when trying to deter organizations that operate on ideological concepts. Terrorism deterrence is, by nature, part of an asymmetrical conflict that differs from both non-conventional warfare, which was learned as part of the battle between the superpowers during the Cold War, and even from conventional warfare, which is backed by a clear and strong state power as opposed to a terrorist organization that may or may not have state backing. Nevertheless, even terrorist deterrence must include an unambiguous clarification that any act will result in a level of punishment that outweighs whatever gains are to be achieved by the act. National legislation by a country that is fighting against terrorism is the appropriate place to present the above-mentioned components of deterrence. Acceptable types of deterrence can be divided according to the element against which it is directed. General deterrence will work against the terrorist organization in order to cause it not to choose the path of terrorism, or at least not to choose certain methods. Punitive deterrence, on the other hand, is intended to deter the terrorist from taking part in terrorist activity. The deterred terrorist or terrorist organization must be rational in order to take into account the cost-benefit considerations (according to the rationale that guides them) that terrorism is not worthwhile and that it is not worth carrying out the acts that are being deterred. The “cost” components must be passed in a clear message to the one being deterred and, as previously stated, legislation is the most appropriate place to accomplish this. The bill has a dual purpose. First, it is designed to create a comprehensive and integrative legal framework for combating terrorism, gathered by relevant authorities from the criminal, administrative and civil fields that, until now, were scattered among the law books of the State of Israel. Second, it seeks to re-define the “terrorism” triangle – What is a “terrorist organization”? Who is a “terrorist”? What is an “act of terror”? A combined approach to these issues will enable the state to combat terrorism in a comprehensive manner. It should be noted that the main issue in dispute, and from which additional questions are derived, concerns the distinction between various kinds of terrorist organizations based on their level of proximity or remoteness to the 'final' act of terrorism – the terrorist attack. In addition, this document will widely discuss the question of whether or not the punishment of a terrorist organization that carries out attacks should be the same as that of an organization whose mission is 'only support for terrorism', and how to express this similarity or difference in the law. This document will examine the various components of the bill in terms of their effectiveness in combatting terrorism and their democratic-liberal ethical standards, as compared to other national laws and to international law. In addition, the document will present elements that we believe are missing from the bill and that should be included. In order to facilitate the reading of the document, the recommendations listed in the position paper are marked in red and are underlined. See, the text of the bill on the Knesset Web site: http://knesset.gov.il/committees/heb/material/data/H07-10-2015_14-42-37_.pdf (Hebrew). The Paper was originally written in Hebrew and was submitted to the Israeli Keneset as part of the deliberations surrounding the bill. Since than the bill passed and was enacted as law. However, we saw importance in detailing the ICT's comments regading the bill as they were presented. Hence, this Paper will disregard the fact that the final version of law is somewhat different and address the version that was discussed at the committee level.